His name was Burton J. Westcott, a businessman and treasurer of a large farm implement company from Indiana. In 1903 he moved his family and his new business, the Westcott Motor Company, to Springfield Ohio. Looking for a place to build his new house, Westcott purchased the only lot remaining on the prestigious East High Street. The street was affectionately called Millionaires’s row and there was a reason this last lot was available, it was next to the cemetery. This small fact did not deter Westcott or his 36 year old architect, Frank Lloyd Wright. By 1906 Wright had completed his design of the Westcott house. It would be a 4435 square foot home designed in his Prairie Style. Upon its completion the neighbors looked down on this new addition to their neighborhood saying it was far too modern. The housing shortage of pre-World War II caused the owners to divide this fine home into 7 separate apartments. The decline of the site continued until purchased in 2000 by the Frank Lloyd Wright Building Conservancy for the sum of $300,000. The house was then turned over to the non-profit Westcott House Foundation for control over the restoration. Five years and $5.8 million were needed to restore the house. 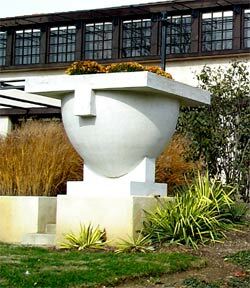 The giant urns guarding the front of the house shout to the neighborhood the Westcott House has returned. Today the Westcott House Museum presents to the public a view of the historic Prairie Style of architecture made famous by Frank Lloyd Wright. Inside the house features Wright's distinctive built-ins and many reproduced examples of Wright's stained-glass designs. Tours of the museum are available as well as a gift shop. Please allow plenty of time for the tour. The Westcott car was a handmade luxury sedan. Westcott Motor Company built cars from 1915 to 1925. Not being able to compete with Ford Motors the company closed its doors and it is said that Burton Westcott died broken hearted the next year. He was 57 years old. A complete Westcott car is available in the Heritage Center of Clark County, Springfield Ohio.